Michelle Davies | The Journal Gazette Cody Sol of the Komets stares down Dane Walters of the Toledo Walleye. In the opinion of many, the Komets-Walleye rivalry is the most heated in the ECHL. The Komets will play 54 of their 72 games in the coming season against Central Division opponents, which could be a mixed bag depending on what you want as a fan. Not all the Komets' best rivalries can be found within the nearby geography. 10. Orlando Solar Bears: The nicknames go back to the International Hockey League. And every year, we think the Solar Bears will be speedy and tough, but the Komets have won 6 of 7 meetings, in games with little physicality but a lot of offensive showmanship. 9. Brampton Beast: Legendary Komets captain Colin Chaulk is the Beast's coach, and he likes his roster to have a lot of familiar faces, like Brandon Marino or Chris Auger, so there's always some reason to be interested. And don't think Chaulk doesn't like to beat his former team, as he's done in 6 of 10 games. 8. Rapid City Rush: In the Central Hockey League, nothing was better because of the hatred, the controversial hits and the drama. They've met only six times in the ECHL – the Komets have won five – but we all still watch intently in hopes it'll truly reignite. 7. Kansas City Mavericks: While the Komets have had the upper hand over their former CHL rivals, winning 7 of 10, what stands out are the weird things that happen. Namely, some epic collapses by the Mavericks, like the 6-5 Fort Wayne win in 2016 that saw five unanswered goals in the final 12:34 and overtime. 6. Indy Fuel: The I-69 rivalry has been a huge disappointment because it hasn't come close to meeting the fire of the old Komets-vs.-Ice days in the IHL. That's got a lot to do with the Fuel's ineptitude – the Komets have a 29-8-3 record in the ECHL series – and that Indy's ticket prices have dissuaded local fans from traveling south. 5. Wheeling Nailers: You're going to have trust us on this one; it's about to get hot. The Nailers are joining the division and they always seem to play an edgy, take-some-chances style and there will be eight meetings this season. Fans in Wheeling, West Virginia, and the Summit City appreciate the same things – victories and toughness – and that'll lead to more great games. 4. Allen Americans: They've met only three times in the regular season since they joined the ECHL, but add on to that the Americans' 2016 victory in the playoff semifinals. But these are two of the Double-A powerhouses and it's not a game you ever want to miss. Remember Spencer Asuchak injuring Fort Wayne goalie Pat Nagle? What about the pregame playoff fracas? Oh, and the Americans' coach is Steve Martinson, a Fort Wayne nemesis. 3. Kalamazoo Wings: Really, this should be No. 1 on the list with the closeness of the arenas and the decades of nearly uninterrupted play. But the Wings have been fielding ho-hum lineups. That said, the Wings have won five of the last six meetings and have a 27-23-2 recent record in the series. Wings goalies always seem to be a problem, though Joel Martin retired. What makes this rivalry so notable, though, is that Komets fans have made Wings Event Centre into Memorial Coliseum 2.0. 2. Cincinnati Cyclones: These are the biggest games on the Cyclones' schedule. And for the Komets, they've gotten bigger and bigger. Throw in three ECHL playoff series, the last two won by Fort Wayne, and it's become must-watch hockey. There have been some memorable plays – Michael Houser's save on sniper Jesse Schultz with 30 seconds left last season to give Fort Wayne a 3-1 series lead – and players changing teams has added to the flavor. Both teams always have a load of offensive flair and grit, a dangerous mix. 1. Toledo Walleye: There's no discussion, the U.S. 24 rivalry is the most hate-filled in the ECHL. Geography has something to do with it. And it's the rare rivalry that isn't confined to just the goings on at ice level. Stories of verbal and physical fan confrontations are common. There's social media banter between the teams' front offices. 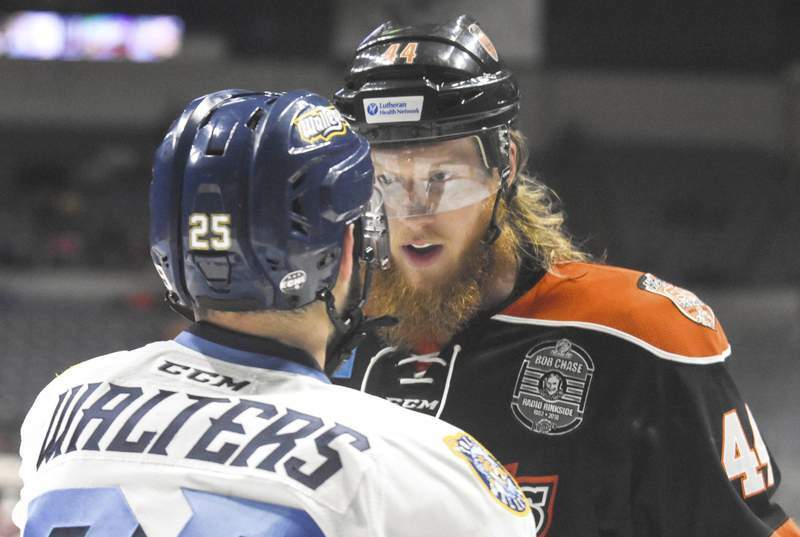 That the Komets finally ousted the Walleye from the playoffs last season should intensify a rivalry that has seen controversial hits from players like A.J. Jenks and Daniel Maggio, suspensions, injuries and magnificently played games. Biggest K's rival? You choose.